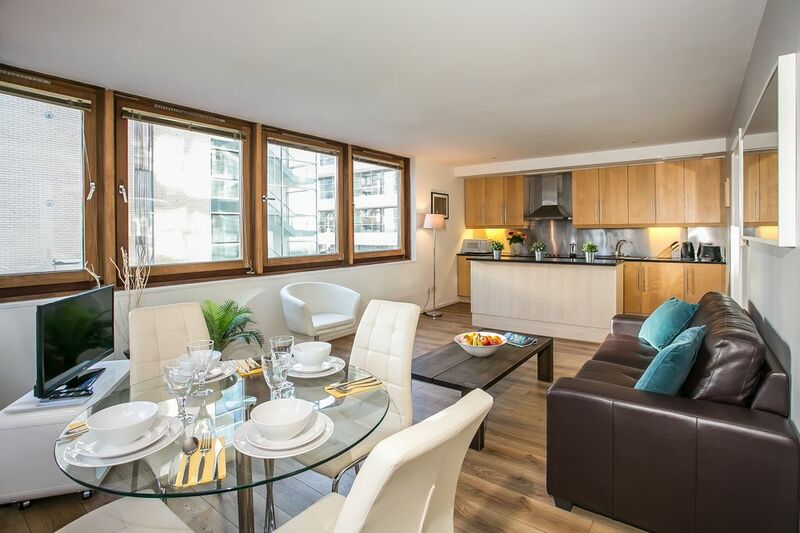 Bright spacious two bedroom apartment in the heart of the IFSC, ideal for a city visit or a corporate base. The property is close by to the 3 concert arena, Aviva stadium, Grafton Street, O'Connell Street, Dublin Convention Centre, and Grand Canal Theatre. LUAS - light rail stops directly outside apartment complex. Johnny Drake has built the short-let serviced apartment company City Break Apartments from the year 2004. The company has been assisting and welcoming the corporate and leisure travellers in Dublin for over a decade, and continuously aims to give the Irish experience with a modern touch. Located in Mayor Street in the IFSC district, this apartment allows the guest to be within walking distance to all the main tourist attractions in the city. Trinity College, Grafton Street, and Temple bar are all within a 25 minutes walk away. O'Connell Street and the Spire are also only 25 minute walk or short 5 min luas ride away, and this landmark is where all of the cities bus lines run through for the more adventurous traveller that wants to leave the city centre. Nearby shops and grocery stores allows for convenience and ease for our guests. Prime location in Dublin City Centre, close to public transit routes, secure buildings for ease of mind, and helpful staff located in our main office to assist in any guest needs from 8:00 am to 8:00 pm. Fully furnished kitchen equipped for a self catering stay. Non smoking apartment - Permitted strictly on balcony only. If there are any special requirements,please don't hesitate to ask. Clean, comfortable, good value for the price and located in a safe area. The walkway outside the apartment can get a bit loud at night (traffic both by foot and car are nearby), but it could be much worse if you were staying in the Temple Bar area which is close by but far enough to remove you from the high pace and crowds. The leasing office was very accommodating and were available for any questions (we had none). Check in was easier than I thought it would be, but I suggest (if you are flying into Dublin) you take them up on the transfer service which takes you right to the office where you check in (which is not where the apartment is). I would have had a hard time finding it were it not for our driver. This made life easy for us. There a TONS of dining options (from fast take out to higher end sit-down restaurants) within walking distance as well as two coffee shops and a griever store only a few feet from the apartment block. The busy, touristy Temple Bar area is walking distance but not so close that you are overrun by tourists here. Overall this was a very positive rental experience for us and if you are traveling with family or for business, this is a great accommodation. Stayed in these apartments during the all Ireland finals with the family. We had booked for 4 x persons but had a last minute guest, the person we spoke to in the office arranged an extra bed free of charge on the spot and the bed was delivered within the next couple of hours. The apartments are spacious, the one we stayed in had a nice large balcony (perfect for us smokers). The location is really nice we first thought that we would be way out of town but ended finding out the we where located 15 minutes walk to O'Connell street and 20 from Temple Bar perfect to celebrate our teams victory ! We stayed at Spencer Dock apartments for 7 nights recently and it was absolutely amazing! From the smooth check-in process, (where they were kind enough to let us check in early) to the sensational service from all staff. We can't fault one thing. We have also used the aiport pick service which is a good value and made the check in very easy. The rooms are very spacious and beautiful and the kitchen had all the utensils needed to use. There is also a big balcony which gives the apartment a big plus (especially for smokers, as the apartments are strictly non-smoking). The location is good for sighseeing, being located within 15 minutes walk to city centre and there is also a tram line within 2 minutes walk. The area is also very quiet and away from the noisy city centre. Overall, we could not ask for more for our city break in Dublin. Would recommend this company and we will use it again when we will come back to Dublin! Stayed in a two bedroom apartment with my family and was very happy with overall experience. Firstly the apartment in very clean, we have young child so this was most important. The kitchen was well equipped and owner obviously listen to the other review which was great for us. Beds are comfortable and quiet. Tram line is 200 meters which is great to get into city otherwise it's 15 minute walk. Very good and recommend airport pick-up service, made for easy check-in. 1. The office where keys are picked up is not close to the apartment. No one was available at the apartment. 2. There is an extra charge for parking: 50 euros a week. This was not mentioned in the quote even though I specifically said parking was required. 3. We had to ask the manager to visit the apartment to show us how to use the kitchen facilities and the TV. No manuals or instructions were in the apartment. 4. Expect very little in the kitchen: No condiments--"salt and pepper shakers" listed on the inventory were paper samples from a fast food place. There were no paper towels or hot pot holders. The coffee pot is a small French press. 5. While there is plenty of light from large windows on either end of the apartment, the only "view" is of other apartment windows sharing a view of each other. 6. The concierge for the buildings is not involved with specific apartment concerns, but is a valuable resource for information about the area. Stayed in Spencer for week in August with my family of 4. Booked with John and found him very help-full regarding how everything works in apartment and also tips on decent restaurants and area's of interest. The apartment is modern building,clean and roomy for 4.Wireless works well which is a must for me.Location is 1 block from River Liffey and about 15/20 minute walk to city centre.There is tram right beside apartments which is great to great around city. Would stay in apartment again and would recommend to someone looking for secure,quiet with-in easy reach on center. Thank you,hope to see you again. These rates do not take in count event (concerts, sport games, bank holiday..). Please contact us if you wish to have further details.